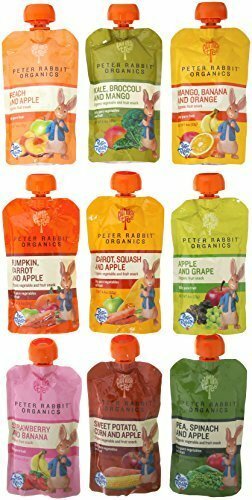 Peter Rabbit Organics 100% Pure Baby Food Variety Pack of 10, Contains 1 Pouch Of Each Flavor, Flavors Included: Pea Spinach & Apple, Mango Banana & Orange, Carrot Squash & Apple, Pumpkin Carrot & Apple, Raspberry Banana & Blueberry, Sweet Potato Corn & Apple, Broccoli & Mango, Apple & Grape, Peach & Apple and Strawberry & Banana. Certified USDA Organic and No Added Salt or Sugar. BPA Free Packaging! If you have any questions about this product by Peter Rabbit Organics, contact us by completing and submitting the form below. If you are looking for a specif part number, please include it with your message.